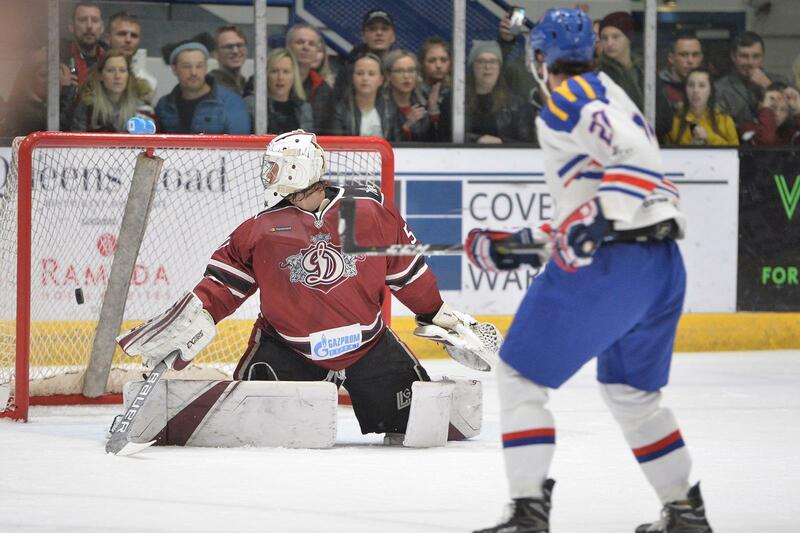 Luke Ferrara scores for Great Britain against Dinamo Riga. Great Britain defeated KHL team Dinamo Riga 3-1 at Coventry’s Skydome in front of a sold-out arena. Cardiff Devils netminder Ben Bowns turned away 41 of the 42 shots he faced. Bowns produced a number of quality saves, including a top class double stop at his near post. Lake, in his first appearance in a GB shirt, broke short-handed and cut inside from the right to fire low and put GB into a 2-0 lead at 23 minutes. Britain went searching for a third goal at the start of the third period, but Ciaran Long couldn’t get his shot away at the back door and Jonathan Phillips fired over. Riga scored on the powerplay at 52-45 with Edijs Branmanis converting to reduce the deficit, but O’Connor scored into an empty net to seal the victory (59-17). “It was great night to play at a packed Skydome in front of so many passionate fans,” said coach Pete Russell. Great Britain platers celebrate a goal against Dinamo Riga. “The team performance was immense. It was fantastic to see us do so well against a quality KHL side. Cardiff Devils players Mark Richardson, Matthew Myers and goalie Bowns were in the GB line-up, while Evan Mosey missed out as he makes progress towards full fitness following a blow to the head. Welsh wingers Ben Davies and Jonathan Phillips, both born in Cardiff, were both in the GB squad. Britain are in the top flight of the World Championships for the first time in almost 25 years and they play Canada, USA, Germany, Denmark, Finland, Slovakia and France. A moment of joy for Great Britain at the Skydome, Coventry. Netminders: Ben Bowns (Cardiff Devils), Jackson Whistle (Sheffield Steelers). Defence: Tim Billingsley (Nottingham Panthers), Dallas Ehrhardt (Manchester Storm), Mark Garside (Belfast Giants), Steve Lee (Nottingham Panthers), Ben O’Connor (Sheffield Steelers), David Phillips (Sheffield Steelers), Mark Richardson (Cardiff Devils), Zach Sullivan (Glasgow Clan), Paul Swindlehurst (Belfast Giants). Following their clash with Riga, GB play five international challenge fixtures in the UK. They are involved in a triangular tournament with Hungary and Italy during April followed by two games against KHL side Torpedo Nizhny Novgorod.